The festival includes a series of cookery demonstrations, special menus in restaurants, a food market, a cheese and wine exposition, wine seminars and culinary trails. It will also include the annual Blas na hEireann National Irish Food awards. 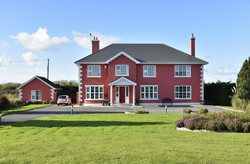 Elmdale is a perfect base for touring the delights that County Clare has to offer including the Cliffs of Moher, the Burren region and the Aran Islands.We are located 8km from Ennis town on the N18 Route.